In June 1950, Communist North Korea invaded the Republic of Korea, and the United States joined other nations to help defend South Korea. The battle for air superiority was vital during this time and also reflected in the end of propeller-driven fighters. The impressive F-86 Sabre will fly again against the MiG-15 this weekend to honor those who played a role, more than 64 years ago. This special demonstration comes to us from our friends at Planes of Fame. 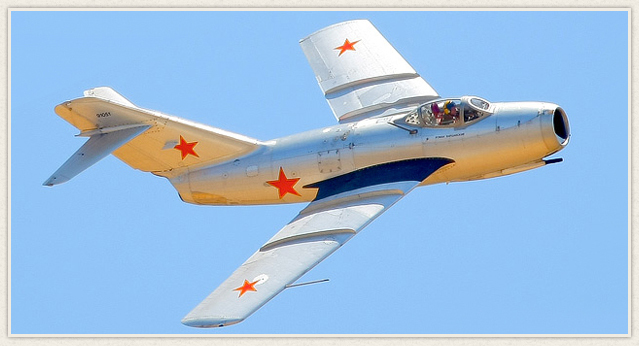 “The prototype of the MiG-15 made its maiden flight on 30 December 1947. The first production aircraft flew exactly one year later. It was in the frozen skies of Korea that the MiG-15 proved one of the most formidable fighters of its generation. On 8 November 1950, MiGs tangled with USAF F-80Cs. Lt. Russell Brown downed one of the communist fighters in history’s first jet-to-jet dogfight. Despite this initial success, the performance of the swept-wing MiG was far superior to that of straight-wing aircraft like the F-80 and the Navy’s F9F Panther. The 4th F.I.W. with its F-86A Sabres was rushed to the Far East, clashing with MiGs for the first time in December. For the next two and a half years Sabers and MiGs (frequently flown by Soviet and other Eastern Bloc pilots) dueled in the skies over the Yalu River in an area called “MiG Ailey.” At the end of the Korean War, Saber pilots claimed a 14:1 (later revised to 7:1) kill ratio over their opponents. This lopsided total is usually attributed to the superior training given to USAF pilots. “The F-86 Sabre was developed in response to a 1944 request for a single-seat high-altitude fighter. The chief designer was Edgar Schmued, who had also designed the P-51 Mustang. 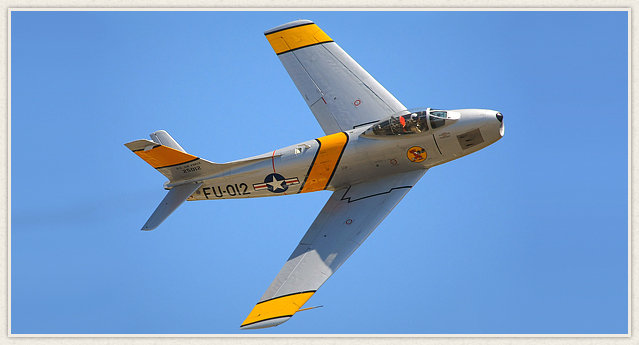 The F-86 was derived from the design of the straight-wing FJ Fury series of Navy aircraft. Following the end of World War 2, German advances in swept-wing research led to the Sabre receiving a 35-degree swept wing. The XP-86 prototype flew on 01 October 1947, and the aircraft entered service with the USAF in 1949 as the F-86A. Several versions were built, with the ultimate day fighter version being the F-86F, of which 2,239 were built. The F-86D was the most-produced version; this model had a large radome in the nose, and a larger fuselage to accommodate an afterburning engine. In truth, the F-86D shared only about 25 percent commonality with other F-86 variants. The Sabre was the primary U.S. air-to-air fighter during the Korean War. It was closely matched to the Russian-designed MiG-15 being flown by Korean, Chinese, and Soviet pilots over “MiG Ailey.” The American pilots were better trained than their enemies, resulting in a favorable kill ratio for the F-86. Of the 40 pilots that achieved “ace” status in Korea, all but one flew F-86s. Come out and see for yourself how the mighty F-86 Sabre was able to defeat the MiG-15 in this tribute to the beginning of jet aircraft supremacy.